Sleep Apnea Surgery Guide – Get the Facts Today! Understanding your sleep apnea surgery options. Options for treatment range from invasive surgeries, to complicated machines, and even some lifestyle changes, however none are 100% effective and without risk. Fortunately, there’s a non-invasive treatment option that has been proven effective in treating mild to moderate cases of OSA for sleep apnea sufferers. Radio Frequency Ablation (RFA) is a simple, painless, non-surgical treatment procedure that uses radio wave energy to shrink the tissue at the back of the tongue that blocks your airway and causes OSA. 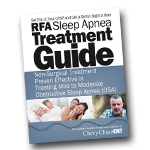 RFA treatment relieves the potential for airway blockage that causes the snoring, breathing disruption, and lack of a good night’s sleep that are associated with untreated OSA. With RFA treatment, patients suffering from mild to moderate OSA can often get rid of their CPAP masks forever. In some cases, and especially with more severe OSA, RFA treatment can make using a CPAP mask more tolerable, due to lower air pressure settings required after the RFA procedure.